Coconut oil is a great natural multi-purpose product, it can be used as an affordable alternative way to look after your skin, hair and your body, it's 100% natural and eco-friendly. Here are 7 ways you can use coconut oil as a skincare and beauty product. You can use coconut oil as an alternative face moisturiser, it has so many benefits and it's affordable, it helps hydrate your skin as well as decrease wrinkles and minimise scars. It will remove any impurities from your skin and leave your skin looking fresh and softer. All you need to do is apply coconut oil to your face and moisturise, at least once a day or as suitable for you. Coconut oil can be used all over the body as well as just your face, if you have dry skin on your body coconut oil can help it soften and also leave your body feel smooth, it is really helpful to use something like coconut oil when you remove hair as well, it is a good shaving oil and it will make removing hair easier and also leave the skin free from irritation. Coconut oil can make your hair look and feel healthier, it can also help with frizziness and dry hair, it will give your hair a natural shine as well as making it strengthen. Simply apply and massage the coconut oil into your hair from the roots to the bottom, a few hours before you wash your hair and then go ahead and wash it out. Or, you can apply it to your hair before you go to bed and then wrap around a towel or a scarf, and then you can wash it in the morning. If you have dry lips coconut oil nourishes the lips, so there is no cracks or flakes on your lips, you simply rub the coconut oil on your lips until you think they are soft and smooth and then rinse. Doing this repeatedly will keep your lips softer for even longer. As it's completely edible, the oil won't do any harm if you ingest a little. Coconut oil will strengthen the nails as well and it also will heal damaged cuticles leaving them soft and clean, as well as helping them soften and avoid any further splitting. It can also help with nail growth as it makes the nails more healthy leading them to grow. 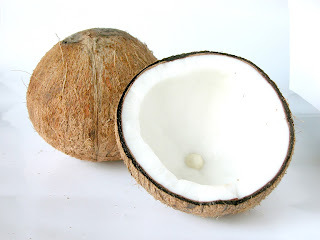 Using coconut to remove makeup naturally is a good way to give some extra moisturiser to your face, and also it can really help with stubborn mascara and eye makeup by removing it easily, this will clean your skin without irritation. All you need to do is massage the coconut oil onto your face and it will remove the makeup and then use a wet towel to remove the excess coconut oil and it will completely remove. Our skin around our eyes is delicate and that is the first place where wrinkles or fine lines show up, using coconut oil as an eye cream can hydrate the wrinkles and fine lines and reinforce your skin's protective barrier. Making your eyes look more refreshed and younger.